Ronald Wilson Reagan (/ˈrɒnəld ˈwɪlsən ˈreɪɡən/; February 6, 1911 – June 5, 2004) was an American actor and politician. He was the 40th President of the United States from 1981 to 1989. He was the Governor of California from 1967 to 1975. Reagan was President of the Screen Actors Guild twice, from 1947 to 1952 and again from 1959 to 1960. Reagan was a movie, television and radio actor before he began his career in politics. Reagan was born in Tampico, Illinois. Reagan had a successful career in Hollywood. He appeared in 53 movies. He married actress Jane Wyman in 1940. The couple divorced in 1949. They had three children. Reagan then married Nancy Davis in 1952. They had two children. Their marriage lasted until Reagan's death in 2004. Before winning his president election in 1980, Reagan ran for president two times in 1968 and in 1976. At 73 years old when re-elected in 1984, he is the oldest person elected president of the United States. He is known as the "Great Communicator" because he was a good public speaker. Reagan was also known as the "Teflon president" because any criticism or scandals against him never stuck or affected his popularity. Reagan still remains one of the most popular presidents in American history because of his optimism for the country. Reagan was the first president of the United States to have been divorced. Reagan was inaugurated in January 1981. As president, Reagan helped create a new political and economic idea. He created the supply-side economic policies. It was later called Reaganomics. Reagan's economic policy lowered tax rates. It created an economic growth and lowered inflation. In his first term he also survived an assassination attempt. Reagan also declared a War on Drugs. Reagan ordered an invasion of Grenada to end a Communist coup. He was re-elected in a landslide victory in 1984. During his second term, Reagan worked on ending the Cold War. He also ordered the 1986 bombing of Libya. In 1987, the Reagan administration faced a political scandal. It was the Iran–Contra affair. 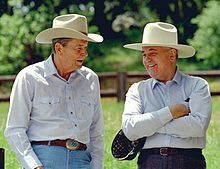 Reagan worked with Soviet General Secretary Mikhail Gorbachev during his second term. This led to the signing of the INF Treaty. It decreased nuclear weapons in the United States and the Soviet Union. Reagan left office in January 1989. Reagan was originally a Democrat. In 1962 he changed to the Republican party. He is ranked high in presidential opinion polls. Reagan died on June 5, 2004 at his Bel Air, Los Angeles home from pneumonia after a ten-year battle with Alzheimer's disease. He was 93 years old. Reagan was born to Jack and Nelle Reagan on February 6, 1911 in a small apartment building in Tampico, Illinois. He had an older brother named Neil. His father was a Roman Catholic of Irish descent. His mother was a Protestant of English and Scottish descent. The family moved to different places in Illinois when Reagan was a child. They moved to Monmouth, Galesburg, and Chicago. His family finally settled in Dixon, Illinois. They lived in a small house in Dixon. His family was very poor. Reagan did not have much as a child. In high school, Reagan enjoyed acting. Reagan was athletic. He became a lifeguard. He saved 77 lives. Reagan graduated from Eureka College in 1932. He became a sports announcer at news radio station WHO. Reagan was also a broadcaster for the Chicago Cubs. He was good at recreating baseball games. He made them interesting. At this time, the radio station would get only the scores. He was fired for not mentioning the show's sponsors. Reagan was soon re-hired. Station executives could not find anyone as capable as Reagan to re-create baseball games. His first screen credit was the starring role in the 1937 movie Love Is on the Air. He then starred in many movies such as Dark Victory with Bette Davis and Humphrey Bogart. Before the movie Santa Fe Trail with Errol Flynn in 1940, he played the role of George "The Gipper" Gipp in the movie Knute Rockne, All American. From his role in the movie, he got the lifelong nickname "the Gipper". In 1941, experts voted him the fifth most popular star from the younger generation in Hollywood. Reagan's favorite acting role was as a double amputee in 1942's Kings Row. In the movie, he says the line, "Where's the rest of me?". It was later used as the title of his 1965 autobiography. Many movie critics thought Kings Row to be his best movie. Even though the movie was popular, it received bad reviews by New York Times critic Bosley Crowther. Although Reagan called Kings Row the movie that "made me a star", he was unable to keep up on his success. This was because he was ordered to active duty with the U.S. Army at San Francisco two months after the movie's release. During World War II, Reagan was separated for four years from his movie career. He served in the First Motion Picture Unit. After the war, Reagan co-starred in such movies such as in, The Voice of the Turtle, John Loves Mary, The Hasty Heart, Bedtime for Bonzo, Cattle Queen of Montana, Juke Girl, This Is the Army, The Winning Team, Tennessee's Partner, and Hellcats of the Navy, in which he worked with his wife, Nancy. Reagan's last movie was a 1964 movie The Killers. Throughout his movie career, his mother, Nelle, often answered much of his fan mail. Reagan was also a spokesperson. He hosted the General Electric Theater since it was first shown in 1953. He was fired in 1962. Reagan was first elected to the board of directors of the Screen Actors Guild in 1941. After World War II, he quickly returned to Screen Actors Guild. Reagan became the 3rd vice-president of the Screen Actors Guild in 1946. Reagan was nominated in a special election to become president of the Screen Actors Guild. Reagan was elected in 1947. Reagan was re-elected president in 1959. He served only a year before resigning in 1960. Reagan led the Screen Actors Guild through labor disputes, the Taft–Hartley Act and the House Un-American Activities Committee (HUAC) hearings and the Hollywood blacklist era. During the late 1940s, Reagan and his then-wife Jane Wyman gave the FBI names of actors whom they believed were communists. Reagan even spoke at a special meeting at Congress on communism in Hollywood as well. "Do they expect us to constitute ourselves as a little FBI of our own and determine just who is a Commie and who isn't?". Reagan was very active in politics near the end of his acting career. Reagan used to be a Democrat. He strongly supported the New Deal. He admired Franklin D. Roosevelt. Over time, Reagan became a conservative Republican. This was because he felt the federal government had too much power and authority. He made a famous speech speaking out against socialized medicine (government run health care). Reagan endorsed Dwight D. Eisenhower and Richard Nixon for the United States presidency. The last time Reagan supported a Democrat was when Helen Gahagan Douglas ran for the United States Senate. You and I have a rendezvous with destiny. We will preserve for our children this, the last best hope of man on earth, or we will sentence them to take the first step into a thousand years of darkness. After Reagan gave this speech, many businesspeople thought that Reagan could run for Governor of California. After giving a speech of Barry Goldwater's presidential campaign in 1964, he was persuaded to run for governor. Reagan ran as a Republican against the then governor, Pat Brown during the 1966 gubernatorial election. Reagan won the election with 3,742,913 (57.55%) of the vote while Brown won 2,749,174 (42.27%) of the vote. Reagan was inaugurated on January 2, 1967. During his years as Governor, Reagan stopped hiring government workers. He did this to slow the growth of California's workforce. Reagan also approved tax increases to balance the state budget. Reagan worked with the Democratic Party majority in the state legislature to help create a major reform of the welfare system in 1971. The reform helped give money to the poor and increase the pay of the rich. During his term as governor, Reagan served as the President of the Republican Governors Association from 1968 to 1969. In 1967, Reagan signed an act that did not allow the public carrying loaded guns. In 1968, a petition to force Reagan into a recall election failed. Reagan ran briefly for president in 1968. He was not nominated by the Republican Party at the 1968 Republican National Convention as Richard Nixon was nominated. On May 15, 1969, during the People's Park protests at the University of California, Berkeley, Reagan sent the California Highway Patrol and other officers to fight off the protests, in an event that became known as "Bloody Thursday". Reagan then called out 2,200 state National Guard troops to occupy the city of Berkeley for two weeks in order to crack down on the protesters. Reagan ran for re-election in the 1970 gubernatorial election against assemblyman Jesse M. Unruh. Reagan won 3,439,174 (52.83%) of the vote while Unruh won 2,938,607 (45.14%) of the vote. During his final term as governor, he played a major role in California's educational system. He raised student loans. This caused a massive protest between Reagan and the college students. Reagan would soon be criticized of his views of the educational system. Reagan left office on January 6, 1975 when Jerry Brown, Pat Brown's son, succeeded Reagan as governor. In 1976, Reagan said he would run again against President Gerald Ford to become the Republican Party's candidate for president. Reagan soon became the conservative candidate with the support of organizations such as the American Conservative Union, which became key supporters of his political run, while Ford was considered a more moderate Republican. Reagan selected United States Senator Richard Schweiker of Pennsylvania as his running mate. Reagan won a few primaries early such as North Carolina, Texas and California, but the soon failed, as he ended up losing New Hampshire, Florida, and his native Illinois. During the 1976 GOP convention, Ford won the nomination with 1,187 delegates to Reagan's 1,070. Ford would go on to lose the 1976 presidential election to the Democratic nominee, Jimmy Carter. Though he lost the nomination, Reagan got 307 write-in votes in New Hampshire, 388 votes as an Independent on Wyoming's ballot, and a single electoral vote from general election from the state of Washington. In November 1979, Reagan announced his plans to run for president again in the 1980 presidential election against incumbent President Jimmy Carter. His campaign slogan, "Make America Great Again", was heavily used in the 1980 election and in Reagan's 1984 re-election campaign. The slogan would be used by Presidents Bill Clinton and Donald Trump in their presidential campaigns. Reagan would face primary challenges from former Director George H. W. Bush, United States representatives John B. Anderson and Phil Crane, United States senators Bob Dole, Howard Baker, Larry Pressler and Lowell P. Weicker, Jr., Governor Harold Stassen, former Treasury Secretary John Connally and to Republican executive Ben Fernandez. In May 1980, Reagan won enough delegates to win the Republican Party nomination. At the 1980 Republican National Convention, Reagan named Bush as his running mate. Reagan's presidential campaign focused on lowering taxes to grow the economy, less government in people's lives, states' rights, and a strong national defense. His relaxed and confident appearance during the televised Reagan-Carter debate on October 28, grew his popularity, and helped to expand his lead in the polls. On November 4, Reagan won the election winning 44 states and 489 electoral votes, to Carter's 49 electoral votes from six states plus the District of Columbia. He won the popular vote by a larger margin, winning 50.7% to Carter's 41.0%, with independent John B. Anderson winning 6.6%. In this present crisis, government is not the solution to our problems; government is the problem. In 1981, Reagan became the first president to propose a constitutional amendment on school prayer. In 1985, Reagan expressed his disappointment that the Supreme Court ruling still bans a moment of silence for public schools, and said he had "an uphill battle." In 1987 Reagan renewed his call for Congress to support voluntary prayer in schools and end "the expulsion of God from America's classrooms." People who did not support this said it is not right for any government force to be included in schools. Reagan was nearly killed in an assassination attempt that happened on Monday, March 30, 1981. 69 days after becoming President, he was leaving after a speaking engagement at the Washington Hilton Hotel in Washington, D.C. He was shot by John Hinckley. Hinckley shot six bullets. White House Press Secretary James Brady was shot in the head. Brady later recovered, but was paralyzed. Two other bullets shot officer Thomas Delahanty in the back, also paralyzing him, and Secret Service agent Timothy McCarthy in the chest. McCarthy took a bullet for Reagan. No one was killed during the event. Reagan was taken to the George Washington University Hospital, which was nearest hospital from the hotel and White House. He suffered a punctured lung and a broken rib bone. He lost about 3/4 of his blood. Reagan soon made a fast recovery after doctors performed surgery. It was later said that the bullet was one inch away from his heart. This made Reagan the only President of the United States to have been shot and survive afterwards. Reagan believed that the government should be small, not big. This means that the government should not interfere in people's lives very much or interfere with what businesses do. He believed in supply-side economics, which was also called Reaganomics and Voodoo economics (by people who didn't like it) during his term. He lowered everybody's income taxes by 25% and cut spending in many government departments. He also lowered inflation from 14% to 4% and he vetoed 78 bills. Reagan's economic plan resulted in a bad economy during the year 1982, but the economy turned around in 1983. The economy soon recovered. Reagan called it "Morning in America". During his presidency the United States declared a "War on Drugs". In the summer of 1981, the union of federal air traffic controllers went on strike. They broke a federal law that does not allow government unions from striking. Reagan said that if the air traffic controllers "do not report for work within 48 hours, they have forfeited their jobs and will be terminated". They did not return and on August 5, Reagan fired 11,345 striking air traffic controllers who had ignored his order, and used supervisors and military controllers to handle the nation's commercial air traffic until new controllers could be hired and trained. The Reagan administration largely ignored the AIDS crisis in the United States in 1981. AIDS research was underfunded during Reagan's administration. There were requests for more funding by doctors at the Centers for Disease Control (CDC), but they were routinely denied. By the end of the first 12 months of the epidemic, when more than 1,000 people had died of AIDS in the United States. By the time President Reagan had given his first speech on the epidemic in 1987, 36,058 Americans had been diagnosed with AIDS and 20,849 had died of it. By the end of 1989, the year Reagan left office, 115,786 people had been diagnosed with AIDS in the United States, and more than 70,000 of them had died of it. On August 20, 1981, Reagan was the honorable guest of Captain Dennis Brooks, commanding officer of the USS Constellation (CV-64). President Reagan arrived on the USS Constellation (CV-64) by helicopter. He spoke to the ship's crew, ate lunch with them and watched a United States Navy tactical display at sea. President Reagan then re-enlisted some US Navy personnel. He then was introduced to Special Agent Craig Goodwin of the Naval Investigative Service (NIS). He was the Special Agent who was assigned aboard the USS Constellation (CV-64). Special Agent Goodwin was later awarded one of the highest civilian medals for his intelligence work, the Meritorious Civilian Service Medal. Reagan's "Evil empire" speech was delivered to the National Association of Evangelicals in Orlando, Florida on March 8, 1983. It is his first recorded use of the phrase. Speaking about the nuclear arms race he said that the Soviet Union as evil. In your discussions of the nuclear freeze proposals, I urge you to beware the temptation of pride, the temptation of blithely declaring yourselves above it all and label both sides equally at fault, to ignore the facts of history and the aggressive impulses of an evil empire, to simply call the arms race a giant misunderstanding and thereby remove yourself from the struggle between right and wrong and good and evil. Audio and text of this speech is available here . In 1983, Reagan sent forces to Lebanon to stop the threat of the Lebanese Civil War. On October 23, 1983, a group of American forces in Beirut were attacked. The Beirut barracks bombing killed 241 American servicemen and wounded more than 60 others by a suicide truck bomber. Reagan withdrew all the Marines from Lebanon. I'm coming before you tonight about the Korean airline massacre, the attack by the Soviet Union against 269 innocent men, women, and children aboard an unarmed Korean passenger plane. This crime against humanity must never be forgotten, here or throughout the world. On October 25, 1983, Reagan ordered U.S. forces to invade Grenada, code named Operation Urgent Fury. Reagan said that there was a "regional threat posed by a Soviet-Cuban military build-up in the Caribbean" in Grenada. Operation Urgent Fury was the first major military operation done by U.S. forces since the Vietnam War. Some days of fighting started, but it resulted in a U.S. victory. In mid-December, U.S. forces withdrew from Grenada after a new form of government was created there. Reagan was once again nominated for president at the 1984 Republican National Convention. His Democratic opponent, was former Vice President Walter Mondale of Minnesota. Reagan's statement made the entire audience laugh including from moderators and Mondale himself. Reagan also repeated his 1980 debate phrase: "There you go again". Reagan was re-elected in 1984 in a landslide victory. Reagan won 49 out of the 50 states. He carried more electoral votes than any other president in American history. Reagan was sworn in as president once again on January 20, 1985 at the White House this time due to cold weather. In the coming weeks, he changed his staff by moving White House Chief of Staff James Baker to Secretary of the Treasury and naming Treasury Secretary Donald Regan to Chief of Staff. Reagan became friends with the Prime Minister of the United Kingdom Margaret Thatcher. Both of them held meetings about the Soviet Union's threat and how to end the Cold War. Reagan became the first American president to ever address the British Parliament. In foreign policy, Reagan ended detente (the policy of being friendly to the Soviet Union) by ordering the largest peacetime military buildup in American history. The U.S. government had to borrow a lot of money to pay for it. He had many new weapons built. Soon, the U.S. began to research on a missile defense system which would destroy missiles. It was to prevent a nuclear war from happening. The program was called Strategic Defense Initiative. It was nicked named "Star Wars". He directed money to anti-communist movements all over the world that wanted to overthrow their communist government. He ordered multiple military operations including the invasion of Grenada and the Libya bombing. In 1985, Mikhail Gorbachev became the new leader of the Soviet Union (which was in bad shape and soon to collapse). Reagan had many talks with him. Their first meeting together was at the Reykjavík Summit in Iceland. They became good friends. Reagan announced a War on Drugs in 1982, because of concerns about the increasing number of people using crack. Even though Richard Nixon declared a war on drugs during the 1970s, Reagan used more militant policies. In 1986, Reagan signed a drug enforcement bill that budgeted $1.7 billion to fund the War on Drugs. It created a mandatory minimum penalty for drug offenses. The bill was criticized for created racial inequalities and mass imprisonment of African-Americans. As a result, First Lady Nancy Reagan created her "Just Say No" campaign to promote anti-drug usage to children. During the Reagan presidency, relations between Libya and the United States were mixed. In early April 1986, relations were escalated when a bomb exploded in a Berlin discothèque. It resulted in the injury of 63 American military personnel and death of one serviceman. In the late evening of April 15, 1986, the United States launched many attacks in Libya. When our citizens are attacked or abused anywhere in the world on the direct orders of hostile regimes, we will respond so long as I'm in this office. Many countries and the United Nations did not like Reagan's decision to bomb Libya. The United Nations said that Reagan violated "the Charter of the United Nations and of international law". Reagan's reputation was badly hurt by the political scandal Iran-Contra Affair. It was about the government illegally selling weapons to Iran. It would later use the profit to support a Nicaraguan terrorist group called the Contras. Reagan told the American people he didn't know anything about the scandal. Reagan funded the Contras to fight off the Communist regime of Daniel Ortega in Nicaragua, but when funding became too expensive, Congress made it illegal to fund the Contras. As a result, the affair took into shape from illegal profit support and funding. His United States National Security Advisor John Poindexter was charged with multiple felonies and later resigned. Reagan later nominated former Ambassador Frank Carlucci to replace Poindexter. His Secretary of Defense Caspar Weinberger was thought to be guilty, but resigned before a trial could begin. Reagan later nominated Carlucci to serve as Defense Secretary for the rest of his term. Oliver North, a member of the United States National Security Council, resigned and was indicted for his involvement in the affair. In February 1987, White House Chief of Staff Donald Regan also resigned because of an ongoing feud between Regan and First Lady Reagan about his handling of the affair. Let's start with the part that is the most controversial. A few months ago I told the American people I did not trade arms for hostages. My heart and my best intentions still tell me that's true, but the facts and the evidence tell me it is not. In the end, fourteen administration officials were indicted and eleven convictions resulted, some of which were vacated on appeal. The rest of those indicted or convicted were all pardoned by President George H. W. Bush, who had been Vice President at the time of the affair. In the 1980s, apartheid in South Africa was becoming more violent and a global issue. The Democrats in the Senate tried to pass the Anti-Apartheid Act in September 1985, but could not overcome a Republican filibuster. Reagan saw it as an act to lower his authority to plan foreign policy. He created own set of sanctions, but Democrats saw them to be "watered down and ineffective". The bill was re-introduced in 1986 and brought up for a vote despite Republican efforts to block it to give Reagan's sanctions time to work. It passed the House with Reagan publicly against it. Later the Senate approved of the bill with a 84-14 vote. On September 26, 1986, Reagan vetoed the bill saying that it would cause an "economic war". Republican Senator Richard Lugar led the Senate of override Reagan's veto. The veto was reverse by Congress (by the Senate 78 to 21, the House by 313 to 83) on October 2. The veto override was the first one on a presidential foreign policy veto in the 20th century. I believe, are not the best course of action; they hurt the very people they are intended to help. My hope is that these punitive sanctions do not lead to more violence and more repression. Our administration will, nevertheless, implement the law. We will never forget them, nor the last time we saw them, this morning, as they prepared for their journey and waved goodbye and 'slipped the surly bonds of Earth' to 'touch the face of God'. The legalization provisions in this act will go far to improve the lives of a class of individuals who now must hide in the shadows, without access to many of the benefits of a free and open society. Very soon many of these men and women will be able to step into the sunlight and, ultimately, if they choose, they may become Americans. [O'Connor] is truly a person for all qualities, having those unique qualities of patience, fairness, intelligent, and devotion to the public good. I commend her to you, and I urge the Senate's swift bipartisan confirmation so that as soon as possible she may take her seat on the Court and her place in history. O'Connor was confirmed by the United States Senate with a vote of 99–0. In his second term in 1986, Reagan nominated William Rehnquist to replace Warren E. Burger as Chief Justice. He named Antonin Scalia to fill the empty seat left by Rehnquist. Robert Bork's America is a land where women would be forced into back-alley abortions, blacks would sit at segregated lunch counters, police could break down citizens' doors in midnight raids, schoolchildren could not be taught about evolution, writers and artists could be censored at the whim of the Government, and the doors of the Federal courts would be shut on the fingers of millions of citizens for whom the judiciary is—and is often the only—protector of the individual rights that are the heart of our democracy. Bork's nomination was rejected by the United States Senate with a vote of 58–42. Reagan then nominated Douglas H. Ginsburg, but Ginsburg withdrew his name from consideration after it was revealed he used cannabis. Reagan later nominated Anthony Kennedy to replace Powell, Jr. and was confirmed with a vote of 97–0. Main article: Tear down this wall! 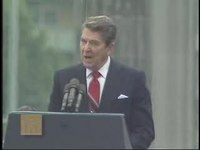 Reagan speaks at the Berlin Wall's Brandenburg Gate, challenging Gorbachev to "tear down this wall"
During his term as president, Reagan saw the change in the direction of the Soviet leadership with Mikhail Gorbachev. Months after his Berlin Wall speech, Gorbachev announced his plans to work with Reagan for a big arms agreements. Reagan and Gorbachev signed the Intermediate-Range Nuclear Forces Treaty which banned nuclear weapons being launched between the United States and the Soviet Union. When Reagan visited Moscow for the fourth summit in 1988, he was seen as a celebrity by the Soviets. A journalist asked the president if he still considered the Soviet Union the evil empire. "No", he replied, "I was talking about another time, another era". In November 1989, ten months after Reagan left office, the Berlin Wall was torn down, the Cold War was officially declared over at the Malta Summit on December 3, 1989, and two years later, the Soviet Union collapsed. Reagan left office with high rankings on January 20, 1989 when his Vice President George H. W. Bush became president. Reagan and his wife, Nancy, soon returned home in Bel Air, Los Angeles, California. In the years after he left office, Reagan's time in office was seen as one of the best and is compared to that of Franklin D. Roosevelt and John F. Kennedy. 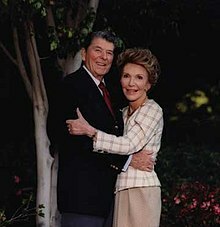 Ronald and Nancy Reagan in 1992 in Los Angeles after leaving the presidency. After leaving office, Reagan and his wife Nancy lived in Bel Air, Los Angeles. They also visited their ranch, Rancho del Cielo. Reagan gave a speech at the 1992 Republican National Convention giving his support for Bush's re-election campaign in the 1992 presidential election. In November 1991, the Ronald Reagan Presidential Library was dedicated and opened to the public in Simi Valley, California. In June 1989, Reagan was honored with Honorary Knighthood and received the Order of the Bath presented by Queen Elizabeth II. He received the Presidential Medal of Freedom in 1993 by President George H. W. Bush. He was the first former living president to receive the honor. Soon afterwards the Ronald Reagan Presidential Foundation created the Ronald Reagan Freedom Award for people who made a big change for freedom. In 1990, Reagan wrote an autobiography titled, An American Life. Even after when he left office, Reagan had a close friendship with both Thatcher and Gorbachev. They would often visit him at his home. In May 1994, Reagan, along with former presidents Gerald Ford and Jimmy Carter, wrote to the U.S. House of Representatives in support of banning "semi-automatic assault guns." On April 13, 1992, Reagan was assaulted by an anti-nuclear protester during a speech while accepting an award from the National Association of Broadcasters in Las Vegas. The protester was Richard Paul Springer. He smashed a 2-foot-high (60 cm) 30-pound (13.5 kg) crystal statue of an eagle that the broadcasters had given to Reagan. Pieces of glass hit Reagan, but he was not injured. Springer was the founder of an anti-nuclear group called the 100th Monkey. Following his arrest on assault charges, a Secret Service spokesman did not say how Springer got past the agents. Later, Springer pled guilty to the federal charge of interfering with the Secret Service, but other felony charges of assault and fighting against officers were dropped. Early in his presidency, Reagan started wearing a hearing aid, first in his right ear and later in his left as well. In 1985, he had colon cancer and skin cancer removed at the Walter Reed National Military Medical Center in Bethesda, Maryland. In 1987, Reagan had surgery to remove polyp of the nose. Also in that year, Reagan went into surgery for an enlarged prostate. In 1994, Reagan was diagnosed with Alzheimer's disease. After announcing his disease, many people sent supporting letters to his California home. There was also an opinion based on unfinished evidence that Reagan had showed symptoms of mental decline while still in office. 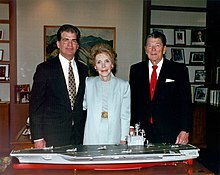 In 1995, the Ronald and Nancy Reagan Research Institute was dedicated in Chicago, Illinois. It is an institution that can help people with Alzheimer's and Parkinson's disease. Reagan suffered a fall at his Bel Air home on January 13, 2001. The fall resulted in a broken hip. The fracture was repaired the following day. Reagan, 89 years old, returned home later that week, although he faced difficult physical therapy at home. Reagan didn't seem to know who I was. ... Oh, my, he's gonzo, I thought. I have to go out on the lawn tonight and tell my countrymen that the president of the United States is a doddering space cadet. I had come that close to reporting that Reagan was senile. As the years went on, the Alzheimer's disease slowly destroyed Reagan's mental capacity. He was only able to recognize a few people, including his wife, Nancy. He remained active during his last years. He took walks through parks near his home and on beaches, played golf regularly, and until 1999 he often went to his office in nearby Century City. On February 6, 2001, Reagan reached the age of 90, becoming the third former president to do so (the other two being John Adams and Herbert Hoover, with Gerald Ford, George H. W. Bush, and Jimmy Carter later reaching 90). Reagan's public appearances became much less frequent with the progression of the disease. His family decided that he would live in quiet semi-isolation with his wife Nancy. Nancy Reagan told CNN's Larry King in 2001 that very few visitors were allowed to see her husband because she felt that "Ronnie would want people to remember him as he was." In that same year, Reagan's daughter, Maureen Reagan, died from melanoma at the age of 60. The USS Ronald Reagan (CVN-76) was finished in 2001. A ceremony was held in March 2001. Reagan's wife, Nancy lead the ceremony. She christened the ship. Reagan could not go because he was very sick. Following her husband's diagnosis and death, Nancy became a stem-cell research advocate. She urged Congress and President George W. Bush to support federal funding for embryonic stem cell research. President Bush opposed the idea. In 2009, she praised President Barack Obama for lifting restrictions on such research. Mrs. Reagan believed that it could lead to a cure for Alzheimer's. Nancy died on March 6, 2016 at the age of 94. On June 5, 2004, Reagan died at the age of 93 of pneumonia, a complication from Alzheimer's disease, in his home in Bel Air, Los Angeles, California. A short time after his death, Nancy Reagan released a statement saying, "My family and I would like the world to know that President Ronald Reagan has died after 10 years of Alzheimer's disease at 93 years of age. We appreciate everyone's prayers." Reagan was granted a state funeral. Reagan's state funeral was the first in the United States since Lyndon B. Johnson in 1973. It was held at the Washington National Cathedral on June 11 and presided by former Missouri United States senator John Danforth. President George W. Bush and former presidents Gerald Ford, Jimmy Carter, George H. W. Bush, and Bill Clinton went to the funeral. First Lady Laura Bush and former first ladies Betty Ford, Rosalynn Carter, and Barbara Bush also went. Former First Lady Lady Bird Johnson did not go to the funeral because of poor health. Reverend Billy Graham, who was Reagan's first choice to lead the funeral, could not go because he was recovering from surgery. Supreme Court justice Sandra Day O'Connor also went to the funeral and delivered a passage from the Bible. The funeral was led by Reagan's close friend and pastor Michael Wenning. Foreign leaders also went to Reagan's funeral, Mikhail Gorbachev, Prime Minister of United Kingdom Tony Blair, German Chancellor Gerhard Schröder, Italian Prime Minister Silvio Berlusconi and interim presidents Hamid Karzai of Afghanistan and Ghazi al-Yawer of Iraq. Former Prime Minister of United Kingdom Margaret Thatcher, former Canadian Prime Minister Brian Mulroney and both presidents Bush gave eulogies. I know in my heart that man is good. That what is right will always eventually triumph. And that there is purpose and worth to each and every life. Reagan met Jane Wyman while filming Brother Rat in 1938. He asked Wyman to marry him at the Chicago Theatre. They were married on January 20, 1940 in Glendale, California. They had two children: Michael (adopted) and Maureen Reagan. They had a third child, Christine Reagan, but she was stillborn. With Reagan's growing political career and the death of their child, Wyman filled for divorce in 1948. The divorce was final in 1949. In 1949, months after divorcing Wyman, Reagan met Nancy Davis. Davis was an actress who was accidentally listed as a communist and asked Reagan to help. After Reagan helped Davis, the two began dating. Three years later, Reagan asked Davis to marry him in Beverly Hills, California. They were married on March 4, 1952 in Hollywood, California. Together, they had two children: Ron and Patti Reagan. Wyman died of natural causes on September 10, 2010. She was aged 90. Nancy outlived her husband by eleven years. She died on March 6, 2016 of heart failure. She was aged 94. In 2000, Ronald and Nancy Reagan received the Congressional Gold Medal in "recognition for their service to their nation". In August 2004, a tribute to Reagan was shown at the 2004 Republican National Convention presented by his son, Michael Reagan. In June 2007, Reagan received the Order of the White Eagle from Poland's president, Lech Kaczyński, for Reagan's work to end communism in Poland. Nancy Reagan travelled to Warsaw to accept the award for her husband. On June 3, 2009, a statue of Reagan was added in the United States Capitol rotunda. The statue represents the state of California in the National Statuary Hall Collection. Following Reagan's death, both major American political parties agreed to place a statue of Reagan instead of that of Thomas Starr King. Also in June 2009, President Obama signed the Ronald Reagan Centennial Commission Act into law. It created a commission to plan activities to mark the upcoming centenary of Reagan's 100 birthday. On July 4, 2011, a statue of Reagan was presented in London. It is outside of the American Embassy in Grosvenor Square. The ceremony was supposed to be attended by Reagan's wife Nancy, but she did not attend. Former Secretary of State Condoleezza Rice took her place and read a statement from her. British Prime Minister during Reagan's presidency, Baroness Thatcher, was also unable to attend due to poor health. A statue of Reagan was presented in November 2011 in Warsaw, Poland. President of Poland Lech Wałęsa was there. In 2011, Reagan was added to the National Radio Hall of Fame. Since 2011, February 6 has been known as Ronald Reagan Day in 21 states across the United States in honor of his birthday. In 2016, Ronald and Nancy Reagan were honored in the Presidential $1 Coin Program in August 2016. He was the last president honored in the program. In August 2017, Secretary of Labor Alexander Acosta honored Reagan at the Labor Hall of Honor as the 2017 edition to the monument. In the 1991 crime/thriller movie Point Break, a face-mask of Reagan is worn by the leader (Patrick Swayze) of the "Ex-Presidents", gang of robbers who wear face-masks of former Presidents during bank robberies. In 2001, Richard Crenna played Reagan in the Oliver Stone television movie The Day Reagan Was Shot. In 2007, the edited version of his diary was published entitled The Reagan Diaries. It became the New York Times Best Seller. Voice actor Hank Azaria voiced Reagan three times (1993, 1994, and 2012) in The Simpsons. Harry Shearer said that Simpsons character Mr. Burns is inspired by Reagan. Seth MacFarlane voiced Reagan in American Dad! and on Family Guy for special episodes. During the history of Saturday Night Live, Reagan has been played by Phil Hartman, Randy Quaid and Robin Williams. In a 2010 short comedy video, Presidential Reunion, actor Jim Carrey played the spirit of Reagan trying to speak to Barack Obama about bank companies and the media. In 2014, Reagan was played by British actor Alan Rickman in Lee Daniels' The Butler. In 2015, Bill O'Reilly published Killing Reagan, the fifth book of his Killing series. It covers the assassination attempt on Reagan in March 1981. A year later, National Geographic Society announced they were making a television movie based on the book. Killing Reagan was premiered on National Geographic on October 16, 2016, with actor Tim Matheson playing Reagan. In late 2015, actor Bruce Campbell played Reagan in the second season of Fox's criminal suspense drama series Fargo. In March 2018, it was confirmed that actor Dennis Quaid would play Reagan in an upcoming movie, titled Reagan, which will be based on Reagan's life. David Henrie will play a younger Reagan in the movie, which is aimed for a summer 2019 release. In October 2018, the Reagan library publicly launched three Reagan holographs: one where Reagan is in the Oval Office, one where he is in a train during his 1984 campaign and one at his Rancho del Cielo. Reagan, by public opinion, is one of the most popular American presidents. His legacy is strongly admired among many conservatives and Republicans. Those who do admire Reagan are sometimes called Reagan coalitionists. According to USA Today, "Reagan transformed the American presidency in ways that only a few have been able to." His role in the Cold War made his image more popular as a different kind of leader as both Reagan and Gorbachev wanted to end nuclear tensions and the war. Reagan ranked third of post–World War II presidents in a 2007 Rasmussen Reports poll, fifth in an ABC 2000 poll, ninth in another 2007 Rasmussen poll, and eighth in a late 2008 poll by British newspaper The Times. In 2011, British historians released a survey to rate American presidents. This poll of British experts in American history and politics said that Reagan is the eighth greatest American president. Reagan was the oldest president up to that time and was supported by young voters, who began to support the Republican party as a result. Reagan is even admired by people of the opposite party, the Democratic Party. Democrats who support Reagan are called Reagan Democrats. 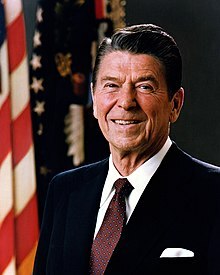 His presidency is sometimes called the Reagan Era because of the changes it brought during Reagan's time as president. In his home state of California, Reagan is seen as a hero. Reagan is known for his witty charm and his warm optimism. The legacy of his economic policies is still divided between people who believe that the government should be smaller and those who believe the government should take a more active role in regulating the economy. While some of his foreign policies were controversial, many thank Reagan for peacefully ending the Cold War. ↑ Schroeder, Patricia (June 6, 2004). "Nothing stuck to 'Teflon' president". USA Today. Retrieved February 18, 2012. ↑ Stuart Fox (June 18, 2010). "How Many Presidents Have Been Divorced?". Live Science.com. Retrieved January 12, 2014. ↑ Hornick, Ed (February 6, 2011). "Reagan's myth has grown over time". CNN. Retrieved 13 October 2014. ↑ 7.0 7.1 Earle, Geoff (July 2, 2014). "Obama is worst president since WWII". New York Post. Retrieved October 13, 2014. ↑ 8.0 8.1 "Ronald Reagan Timeline". NPR.com. Retrieved January 10, 2014. ↑ 9.0 9.1 9.2 9.3 9.4 9.5 Tintori, Sarah (2012). "Ronald Reagan: From Broadcaster to President". lib.niu.edu. Retrieved October 13, 2014. ↑ "Ronald Reagan". History.com. Retrieved January 12, 2014. ↑ "Cupid's Influence on the Film Box-Office". The Argus (Melbourne, Vic. : 1848 - 1956). Melbourne, Vic. : National Library of Australia. October 4, 1941. p. 7 Supplement: The Argus Week-end Magazine. Retrieved April 24, 2012. ↑ Reagan, Ronald (1965). Where's the Rest of Me?. New York: Duell, Sloan, and Pearce. ISBN 0-283-98771-5. ↑ Wood, Brett. "Kings Row". TCM website. Turner Classic Movies. Retrieved March 24, 2009. ↑ Crowther, Bosley (February 3, 1942). "The Screen; 'Kings Row,' With Ann Sheridan and Claude Rains, a Heavy, Rambling Film, Has Its First Showing Here at the Astor". The New York Times. Retrieved March 29, 2007. ↑ "Ronald Reagan Appears as Drake McHugh in Kings Row". World History Project.org. Retrieved January 12, 2014. ↑ "Ronald Reagan applies for transfer to Army Air Force". History.com. Retrieved January 12, 2014. ↑ 17.0 17.1 George J. Siegel. "1st Motion Picture Unit". Military Museum. Retrieved May 11, 2018. ↑ "Ronald Reagan". IMDb. Retrieved December 30, 2007. ↑ "Ronald Reagan". Radiohof.org. Retrieved January 12, 2014. ↑ 20.0 20.1 Michael Reagan (February 4, 2011). "Ronald Reagan's Son Remembers The Day When GE Fired His Dad". investors.com. Retrieved February 5, 2011. ↑ 21.0 21.1 21.2 21.3 21.4 21.5 21.6 "Screen Actors Guild Presidents: Ronald Reagan". Screen Actors Guild. Archived from the original on December 28, 2007. Retrieved November 10, 2008. ↑ 22.0 22.1 "American Notes Hollywood". Time. September 9, 1985. Retrieved April 21, 2009. ↑ "House Un-American Activities Committee Testimony: Ronald Reagan". Tennessee Wesleyan College. Retrieved September 9, 2014. ↑ K. Alan Synder (August 20, 2008). "First Principles Ronald Reagan on Franklin D. Roosevelt". First Principles Journal.com. Retrieved January 10, 2014. ↑ "Vintage Reagan Bemoans 'Socialized Medicine' in YouTube Sensation". Fox News Channel. Retrieved September 23, 2014. ↑ Regan, Ronald (1990). An American Life: The Autobiography. New York City: Simon & Schuster. ISBN 0671691988. Retrieved March 31, 2014. ↑ "The Crist Switch: Top 10 Political Defections". Time. May 2010. Retrieved March 31, 2014. ↑ 28.0 28.1 Reagan, Ronald (1964). "A Time for Choosing". pbs.org. Retrieved January 16, 2014. ↑ "Ronald Reagan -- A Time for Choosing". Americanhetoric.com. Retrieved October 6, 2014. ↑ 30.0 30.1 30.2 30.3 30.4 30.5 30.6 "Ronald Reagan". Governors.library.ca.gov. Retrieved January 10, 2014. ↑ "Reagan nominated for governor of California". History.com. Retrieved January 10, 2014. ↑ Anderson, Totton J.; Lee, Eugene C. (June 1967). "The 1966 Election in California". The Western Political Quarterly 20 (2): 535-554. doi:10.2307/446081. https://www.jstor.org/stable/446081. Retrieved February 6, 2017. ↑ Steven Hayward (December 1999). "Welfare Reform: Another Win For The Gipper". Ashbrook.org. Retrieved January 10, 2014. ↑ "Chris Christie kicks off term as Republican Governors Association chairman". Daily News. New York. Retrieved January 10, 2014. ↑ "From "A Huey P. Newton Story"". PBS. Retrieved July 7, 2010. ↑ "Recall Idea Got Its Start in L.A. in 1898". Los Angeles Times. July 13, 2003. ↑ . (February 16, 1970). "Postscript to People's Park". Time. Retrieved December 9, 2007. ↑ Jeffery Kahn (8 June 2004). "Ronald Reagan launched political career using the Berkeley campus as a target". Retrieved 9 October 2014. ↑ Anderson, Totton J.; Bell, Charles G. (June 1971). "The 1970 Election in California". The Western Political Quarterly 24 (2): 252-273. doi:10.2307/446870. https://www.jstor.org/stable/446870. Retrieved February 6, 2017. ↑ "1970 Gubernatorial General Election Results – California". uselectionatlas.org. Retrieved December 5, 2015. ↑ 41.0 41.1 "Biography of Gerald R. Ford". The White House. Archived from the original on April 11, 2007. Retrieved March 29, 2007. Ford called himself "a moderate in domestic affairs, a conservative in fiscal affairs, and a dyed-in-the-wool internationalist in foreign affairs." ↑ John Gizzi. "Richard Schweiker is Ronald Reagan's Running Mate". Newsmax. Retrieved November 3, 2017. ↑ "Candidate Reagan is Born Again". Time (magazine). September 24, 1979. Retrieved May 10, 2008. ↑ 44.0 44.1 "1976 New Hampshire presidential Primary, February 24, 1976 Republican Results". New Hampshire Political Library. Archived from the original on October 6, 2006. Retrieved November 10, 2008. ↑ "Electoral College Box Scores 1789–1996". U.S. National Archives and Records Admin. Retrieved April 30, 2007. 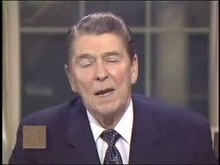 ↑ "Ronald Reagan Presidential Campaign Announcement". C-Span. November 13, 1979. Retrieved May 15, 2018. ↑ Matt Taibbi (March 25, 2015). "Donald Trump Claims Authorship of Legendary Reagan Slogan; Has Never Heard of Google". Rolling Stone. Retrieved January 27, 2016. ↑ Margolin, Emma (September 9, 2016). "Who really first came up with the phrase 'Make America Great Again'?". NBC. Retrieved September 10, 2016. ↑ "Bill Clinton suggests Trump slogan racist – but he used the same one". Fox News. September 9, 2016. Retrieved January 22, 2018. ↑ "1980: Presidential Campaigns and References". Presidential Campaigns and Elections. Retrieved May 15, 2018. ↑ Ciccone, F. Richard (May 27, 1980). "Bush quits, backs Reagan". Chicago Tribune. Retrieved 2009-02-03. ↑ Josh Zeitz (July 13, 2016). "5 Times the Vice Presidential Pick Surprised Everyone". Politico. Retrieved May 15, 2018. ↑ Uchitelle, Louis (September 22, 1988). "Bush, Like Reagan in 1980, Seeks Tax Cuts to Stimulate the Economy". The New York Times. Retrieved February 6, 2008. ↑ Hakim, Danny (March 14, 2006). "Challengers to Clinton Discuss Plans and Answer Questions". The New York Times. Retrieved February 6, 2008. ↑ Kneeland, Douglas E. (August 4, 1980) "Reagan Campaigns at Mississippi Fair; Nominee Tells Crowd of 10,000 He Is Backing States' Rights." The New York Times. p. A11. Retrieved January 1, 2008. ↑ 57.0 57.1 Cannon, Lou. "Ronald Reagan: Campaigns and Elections". Miller Center of Public Affairs, University of Virginia. Retrieved March 27, 2018. ↑ 58.0 58.1 "1980 Presidential Election Results". Atlas of U.S. Presidential Elections. Retrieved March 28, 2007. ↑ Peters, Gerhard; Woollley, John T. "Election of 1980". Santa Barbara, California: The American Presidency Project. Retrieved March 27, 2018. ↑ David M. Ackerman, The Law of Church and State: Developments in the Supreme Court Since 1980. Novinka Books, 2001. p. 2. ↑ George de Lama, Reagan Sees An "Uphill Battle" For Prayer In Public Schools. June 7, 1985, Chicago Tribune. ↑ 63.0 63.1 Stuart Taylor Jr., High Court Accepts Appeal Of Moment Of Silence Law. January 28, 1987, The New York Times. ↑ 64.00 64.01 64.02 64.03 64.04 64.05 64.06 64.07 64.08 64.09 64.10 64.11 64.12 64.13 "Remembering the Assassination Attempt on Ronald Reagan". CNN. Retrieved August 20, 2014. ↑ "Ronald Reagan". History.com. Retrieved December 21, 2014. ↑ 66.0 66.1 "Morning in America". US History.org. Retrieved January 10, 2014. ↑ Glass, Andrew (October 14, 2010). "Reagan declares 'War on Drugs,' October 14, 1982". politico.com. Retrieved October 13, 2014. ↑ "Remarks and a Question-and-Answer Session With Reporters on the Air Traffic Controllers Strike". Ronald Reagan Presidential Foundation. 1981. Retrieved May 13, 2007. ↑ "Unhappy Again". Time. October 6, 1986. Retrieved August 15, 2007. ↑ 71.0 71.1 71.2 Bronski, Michael. "Rewriting the Script on Reagan: Why the President Ignored AIDS". Retrieved March 13, 2016. ↑ Shilts, Randy. And the Band Played On: Politics, People, and the AIDS Epidemic. Macmillan. Retrieved March 12, 2016. ↑ 74.0 74.1 74.2 "20 August 1981 – Remarks on Board the U.S.S. Constellation off the Coast of California". Reagan.utexas.edu. Retrieved August 20, 2014. ↑ "Reagan's Evil Empire". History.com. Retrieved January 19, 2015. ↑ "Ronald Reagan's 'Evil Empire' Speech". National Center.org. Retrieved October 6, 2014. ↑ Timothy J. Geraghty (2009). Peacekeepers at War: Beirut 1983—The Marine Commander Tells His Story. Potomac Books. p. 254. ISBN 978-1-59797-595-7. ↑ Lou Cannon and Carl M. Cannon (2007). Reagan's Disciple: George W. Bush's Troubled Quest for a Presidential Legacy. PublicAffairs. p. 154. ↑ 79.0 79.1 79.2 "Transcript of President Reagan's adress on downing of Korean airliner". New York Times.com. Retrieved August 22, 2014. ↑ "GPS as We Know It Happened Because of Ronald Reagan". Bloomberg BusinessWeek. Retrieved December 21, 2014. ↑ "Ronald Reagan, Address to the Nation on KAL 007". Presidentialrhetoric.com. Retrieved December 28, 2014. ↑ 82.0 82.1 82.2 "Operation Agent Fury" (PDF). Defense Technical Information Center. Archived from the original (PDF) on June 5, 2007. Retrieved March 9, 2007. ↑ 83.0 83.1 83.2 83.3 83.4 83.5 83.6 "Ronald Reagan: The 'Great Communicator'". CNN. Retrieved August 15, 2014. ↑ "The Debate: Mondale vs. Reagan". National Review. October 4, 2004. Archived from the original on April 16, 2007. Retrieved May 25, 2007. ↑ "Reaction to first Mondale/Reagan debate". PBS. October 8, 1984. Archived from the original on January 25, 2008. Retrieved December 31, 2007. ↑ 86.0 86.1 86.2 "1984 Presidential Debates". CNN. Archived from the original on March 8, 2007. Retrieved May 25, 2007. ↑ "Phil Gailey and Warren Weaver Jr., "Briefing"". The New York Times. June 5, 1982. Retrieved January 27, 2011. ↑ "Ronald Reagan Address to British Parliament". The History Place. Retrieved April 19, 2006. ↑ "Cold War". Histclo.com. Retrieved October 6, 2014. ↑ 90.0 90.1 "Reagan's Missile Shield in Space, 'Star Wars,' Is Pronounced Dead". The New York Times. Retrieved September 6, 2014. ↑ Wicker, Tom (January 7, 1988). "In the nation; A law that's failed". The New York Times. New York. ISSN 0362-4331. Retrieved October 13, 2014. ↑ "Reagan and Gorbachev meet in Reykjavik". History.com. Retrieved September 27, 2014. ↑ 94.0 94.1 "Thirty Years of America's Drug War". Retrieved April 4, 2007. ↑ "The 'just say no' first lady". MSNBC. February 18, 2004. Retrieved June 24, 2007. ↑ 96.0 96.1 "Libya: Fury in the Isolation Ward". Time. August 23, 1982. Retrieved August 12, 2011. ↑ 97.0 97.1 "Operation El Dorado Canyon". GlobalSecurity.org. April 25, 2005. Retrieved April 19, 2008. ↑ 98.0 98.1 98.2 "1986:US Launches air-strike on Libya". BBC News. April 15, 2008. Retrieved April 19, 2008. ↑ 99.0 99.1 "A/RES/41/38 November 20, 1986". United Nations. Retrieved April 14, 2014. ↑ 100.0 100.1 100.2 100.3 100.4 100.5 "IRAN-CONTRA REPORT; Arms, Hostages and Contras: How a Secret Foreign Policy Unraveled". The New York Times. November 19, 1987. Retrieved September 7, 2014. ↑ LINDA GREENHOUSEPublished: December 08, 1992 (1992-12-08). "Supreme Court Roundup; Iran-Contra Appeal Refused by Court - New York Times". The New York Times. Retrieved 2013-02-01. ↑ 102.0 102.1 "Frank C. Carlucci, Diplomat and Defense Secretary to Reagan, Dies at 87". June 4, 2018. Retrieved June 4, 2018 – via NYTimes.com. ↑ "Pardons and Commutations Granted by President George H. W. Bush". United States Department of Justice. Retrieved 2008-04-22. ↑ "North Quits Marines". The New York Times. March 19, 1988. Retrieved December 21, 2012. ↑ "Donald Regan's 1989 Review of Nancy Reagan's Memoir". Washingtonian. December 1, 1989. Retrieved June 5, 2018. ↑ 106.0 106.1 106.2 "Iran Arms and Contra Aid Controversy". PBS. Retrieved December 28, 2014. ↑ "Pardons and Commutations Granted by President George H. W. Bush". United States Department of Justice. Retrieved 22 April 2008. ↑ "The Deseret News - Google News Archive Search". ↑ 110.0 110.1 "The Deseret News - Google News Archive Search". ↑ "New Sunday Times - Google News Archive Search". ↑ "Excerpts From Speech In Response To Reagan". The New York Times. July 23, 1986. ↑ "The Glasgow Herald - Google News Archive Search". ↑ 114.0 114.1 Roberts, Steven V. (October 3, 1986). "Senate, 78 to 21, Overrides Reagan's Veto and Imposes Sanctions on South Africa". The New York Times. Retrieved 2 February 2009. ↑ "Indiana's Richard Lugar helped Mandela's anti-apartheid cause". Indianapolis Star. Retrieved 2017-10-18. ↑ "The Courier - Google News Archive Search". ↑ "Statement on the Comprehensive Anti-Apartheid Act of 1986, October 2, 1986". Reagan.U Texas.edu. Retrieved July 30, 2018. ↑ 118.0 118.1 "Ronald Reagan Postpones His Address". Time (magazine). Retrieved December 21, 2014. ↑ "Address to the nation on the Challenger disaster". Ronald Reagan Presidential Library. Retrieved July 4, 2006. ↑ "Ronald Reagan's Speech on the Challenger Disaster". Historyplace.com. Retrieved October 6, 2014. ↑ 121.0 121.1 "Reagan and Bush acted alone on immigration too". The Denver Post. Retrieved November 20, 2014. ↑ "Statement on Signing the Immigration Reform and Control Act of 1986". Reagan.UTexas.edu. Retrieved December 28, 2014. ↑ Steven R. Weisman (July 7, 1981). "Reagan Nominating Woman, an Arizona Appeals Judge, to Serve on Supreme Court". The New York Times. Retrieved April 12, 2017. ↑ 124.0 124.1 "Reagan's Nomination of O'Connor". National Archives. August 19, 1981. Retrieved April 12, 2017. ↑ "Remarks Announcing the Intention To Nominate Sandra Day O'Connor To Be an Associate Justice of the Supreme Court of the United States". July 7, 1981. Retrieved April 12, 2017. ↑ 126.0 126.1 Bernard Weinraub (June 18, 1986). "BURGER RETIRING, REHNQUIST NAMED CHIEF; SCALIA, APPEALS JUDGE, CHOSEN FOR COURT". The New York Times. Retrieved April 12, 2017. ↑ 127.0 127.1 127.2 Reston, James (July 5, 1987). "Washington; Kennedy And Bork". The New York Times. Retrieved April 28, 2008. ↑ "34. The Bork Nomination". Eightiesclub.tripod.com. Archived from the original on 2006-01-06. Retrieved June 20, 2010. ↑ Greenhouse, Linda (October 24, 1987). "Bork's Nomination Is Rejected, 58–42; Reagan 'Saddened'". The New York Times. Retrieved November 12, 2007. ↑ "Anthony M. Kennedy". Supreme Court Historical Society. 1999. Archived from the original on November 3, 2007. Retrieved November 12, 2007. ↑ 132.0 132.1 "Reagan's 'tear down this wall' speech turns 20". USA Today. June 12, 2007. Retrieved 2008-02-19. ↑ "Ronald Reagan 'Tear Down This Wall' Speech". Historyplace.com. Retrieved October 6, 2014. ↑ Keller, Bill (March 2, 1987). "Gorbachev Offer 2: Other Arms Hints". The New York Times. Retrieved March 17, 2008. ↑ Gordon, Michael R. (July 28, 2014). "U.S. says Russia tested Cruise Missile, violating treaty". The New York Times. New York. ISSN 0362-4331. Retrieved October 13, 2014. ↑ Talbott, Strobe (August 5, 1991). "The Summit Goodfellas". Time. Retrieved January 26, 2008. ↑ "1989: Malta summit ends Cold War". BBC News. December 3, 1984. Retrieved August 12, 2011. ↑ "American President: Ronald Wilson Reagan: Life After the Presidency". Miller Center.org. Retrieved January 19, 2015. ↑ "Reagan 2020: 1992 Republican National Convention". Reagan 2020.us. Retrieved October 1, 2014. ↑ "Four Presidents Join Reagan in Dedicating His Library". The New York Times. Retrieved October 1, 2014. ↑ "Accolade for Reagan: Honorary Knighthood". The New York Times. June 14, 1989. Retrieved January 17, 2015. ↑ "Reagan to Receive Medal of Freedom". Los Angeles Times. Retrieved October 6, 2014. ↑ "Presentation Presidential Medal of Freedom". C-Span.org. January 13, 1993. Retrieved January 26, 2015. ↑ "The Ronald Reagan Freedom Award". Ronald Reagan Presidential Foundation. Archived from the original on October 16, 2006. Retrieved February 24, 2007. ↑ Eaton, William J. (May 5, 1994). "Ford, Carter, Reagan Push for Gun Ban". Los Angeles Times. Retrieved July 4, 2014. ↑ "Protester at Reagan Speech Had Press Credentials". The New York Times. Retrieved July 27, 2016. ↑ "Man Who Disrupted Reagan Speech Flees 4-Month Jail Term". Los Angeles Times. Retrieved July 28, 2016. ↑ "How Do You Really Protect a President?". Los Angeles Times. Retrieved July 28, 2016. ↑ "Activist pleads guilty in Reagan attack". Deseret News. Retrieved July 28, 2016. ↑ Weisman, Steven R. (September 8, 1983). "Reagan Begins to Wear a Hearing Aid in Public". The New York Times. Retrieved June 13, 2008. ↑ "Reagan Begins Using A Second Hearing Aid". United Press International. March 21, 1985. Retrieved June 13, 2008. ↑ Friess, Steve (August 9, 2006). "He amplifies hearing aids". USA Today. Retrieved June 13, 2008. ↑ 153.0 153.1 James Gerstenzang (July 31, 1987). "Reagan Will Face Surgery Today for Cancer on Nose". Los Angeles Times. Retrieved January 10, 2014. ↑ Altman, Lawrence K (January 6, 1987). "President is Well after Operation to Ease Prostate". The New York Times. Retrieved June 13, 2008. ↑ 155.0 155.1 Gordon, Michael R. (November 6, 1994). "In Poignant Public Letter, Reagan Reveals That He Has Alzheimer's". The New York Times. Retrieved February 10, 2013. ↑ "When Did Ronald Reagan Have Alzheimer's? The Debate Goes On". CBS News. February 6, 2011. Retrieved February 8, 2013. ↑ "The Alzheimer's Letter". PBS. Retrieved February 10, 2013. ↑ Altman, Lawrence K (November 13, 1994). "November 6–12: Amid Rumors; Reagan Discloses His Alzheimer's". The New York Times. Retrieved February 10, 2013. ↑ "President Ronald Reagan's Alzheimer's Disease". Radio National. June 7, 2004. Retrieved February 10, 2013. ↑ 160.0 160.1 "Alzheimer's Association Ronald and Nancy Reagan Research Institute". Medical News Today. June 5, 2004. Retrieved 2008-03-14. ↑ 161.0 161.1 "Reagan Breaks Hip In Fall at His Home". The New York Times. January 13, 2001. Retrieved June 18, 2008. ↑ 162.0 162.1 Lesley Stahl (1999). Reporting Live. Simon & Schuster. pp. 256 &amp, 318. ISBN 0-684-82930-4. ↑ 163.0 163.1 163.2 Altman, Lawrence K (October 5, 1997). "Reagan's Twighlight– A special report; A President Fades Into a World Apart". The New York Times. Retrieved June 18, 2008. ↑ "Reagan Resting Comfortably After Hip Surgery". CNN. January 13, 2001. Retrieved December 28, 2007. ↑ "Nancy Reagan Reflects on Ronald". CNN. March 4, 2001. Retrieved April 6, 2007. ↑ "Reagan's Daughter Mourned". New York Daily News.com. August 9, 2001. Retrieved September 9, 2014. ↑ 167.0 167.1 167.2 167.3 167.4 "Ronald Reagan (CVN 76) Christening: Advanced Media Kit" (PDF). Northrop Grumman Shipbuilding. Retrieved December 27, 2009. ↑ Gordon, Craig (March 9, 2009). "Nancy Reagan praises Obama". Politico.com. Retrieved October 27, 2011. ↑ "Nancy Reagan plea on stem cells". BBC News. May 10, 2004. Retrieved June 6, 2007. ↑ 170.0 170.1 170.2 Lou Cannon (March 6, 2016). "Nancy Reagan, an Influential and Stylish First Lady, Dies at 94". The New York Times.com. Retrieved March 6, 2016. ↑ Von Drehle, David (June 6, 2004). "Ronald Reagan Dies: 40th President Reshaped American Politics". The Washington Post. Retrieved December 21, 2007. ↑ 172.0 172.1 172.2 172.3 172.4 172.5 Branigin, William (June 11, 2004). "Thousands bid farewell to Reagan in funeral service". The Washington Post. Washington DC. ISSN 0190-8286. Retrieved October 13, 2014. ↑ Stapert, Craig W. (2004). "Washington National Cathedral : State Funeral for President Ronald Reagan". nationalcathedral.org. Retrieved October 13, 2014. ↑ 174.0 174.1 "Cathedral to host 1st presidential funeral since '69". USA Today.com. Retrieved September 23, 2014. ↑ "Michael Wenning, Reagans' Pastor, Dies at 75". The New York Times. Associated Press. June 30, 2011. ↑ 176.0 176.1 Dennis Welzenbach (June 7, 2004). "Burial of a President - A Behind the Scenes Diary". Suhor Industries. Retrieved December 28, 2015. ↑ "DISPUTE OVER THEATER SPLITS CHICAGO CITY COUNCIL". The New York Times.com. May 8, 1984. Retrieved March 6, 2016. ↑ 178.0 178.1 178.2 178.3 178.4 Elizabeth Blair (September 10, 2007). "Oscar Winner Jane Wyman, Reagan's First Wife, Dies". NPR. Retrieved March 6, 2016. ↑ 179.0 179.1 "First Ladies: Nancy Reagan". The White House. Retrieved March 8, 2007. ↑ 180.0 180.1 180.2 "Ronald Reagan and Nancy Davis marry". History.com. Retrieved March 6, 2016. ↑ "A Congressional Gold Medal for President Ronald W. Reagan and the First Lady". History.House.gov. July 17, 2000. Retrieved January 25, 2015. ↑ "Michael Reagan to Speak At Republican National Convention Against Human Embryo Research". Life Site News.com. August 13, 2004. Retrieved December 21, 2014. ↑ 183.0 183.1 Monica Scislowska (October 2, 2013). "Arm cut off of Reagan statue in Poland". USA Today.com. Retrieved January 25, 2015. ↑ "Emotional Nancy Reagan unveils statue of former president". CNN. Retrieved November 20, 2014. ↑ "Reagan statue unveiled in Capitol Rotunda". MSNBC. Associated Press. June 3, 2009. Retrieved February 8, 2011. ↑ Khan, Huma (June 2, 2009). "President signs Ronald Reagan Centennial Commission Act alongside Mrs. Reagan". ABC News. Retrieved October 13, 2014. ↑ "Obama creates Reagan centennial commission". MSNBC. Associated Press. June 2, 2009. Retrieved February 8, 2011. ↑ 188.0 188.1 "Ronald Reagan statue unveiled at US Embassy in London". BBC News. July 4, 2011. Retrieved August 12, 2011. ↑ Rolak, Raymond (2011). "Warsaw monument to honor Reagan". polishnews.com. Retrieved October 13, 2014. ↑ "Ronald Reagan". RadioHOF.org. Retrieved January 25, 2015. ↑ "Reagan Day proclamations" (PDF). Ronald Reagan Legacy Project.org. Retrieved May 24, 2014. ↑ 192.0 192.1 "Ronald Reagan Presidential $1 Coin Design Candidates". Coin News.com. Retrieved May 23, 2015. ↑ "U.S. SECRETARY OF LABOR ACOSTA ANNOUNCES THE UPCOMING INDUCTION OF PRESIDENT RONALD REAGAN INTO THE DEPARTMENT OF LABOR HALL OF HONOR". United States Department of Labor. August 24, 2017. Retrieved November 7, 2017. ↑ Maslin, Janet (July 12, 1991). "Surf's Up For F.B.I. In Bigelow's Point Break". The New York Times. Retrieved April 24, 2009. ↑ 195.0 195.1 Kevin Whicks (June 15, 2012). "First Look: Alan Rickman as Ronald Reagan in 'The Butler'". BBC America.com. Retrieved October 18, 2016. ↑ Howard Rosenberg (December 7, 2001). "Film on Reagan Shooting Plays Loose With Facts". Los Angeles Times. Retrieved October 18, 2016. ↑ Daniel Trotta (May 1, 2007). "Reagan diaries reveal president's private musings". Reuters. Retrieved January 25, 2015. ↑ "Best Sellers - The New York Times". The New York Times. June 12, 2012. Retrieved April 12, 2014. ↑ "Ronald Reagan". Simpsons Wiki.com. Retrieved October 19, 2016. ↑ Marder, Keith (April 28, 1994). "Real People are Models for 'Simpsons' Voices". Times-Union. p. C4. ↑ "Ronald Reagan". American Dad! Wiki.com. Retrieved October 19, 2016. ↑ "Ronald Reagan". Family Guy Wiki.com. Retrieved October 19, 2016. ↑ Christian Kraupse (September 27, 2012). "Best of the SNL Presidents". Crave Online.com. Retrieved October 19, 2016. ↑ "Jim Carrey, Will Ferrell play Reagan and Bush in 'SNL' Presidential Reunion". Hitfix.com. March 3, 2010. Retrieved October 19, 2016. ↑ 205.0 205.1 "Bill O'Reilly to 'kill' again with his new book on Reagan". CNN. Retrieved 30 May 2015. ↑ "National Geographic Channel adapting 'Killing Reagan' as a TV Movie". United Press International. September 25, 2015. Retrieved September 26, 2015. ↑ Daniel Fienberg (October 17, 2016). "'Killing Reagan': TV Review". The Hollywood Reporter. Retrieved October 18, 2016. ↑ Daniel Fienberg (November 9, 2016). "'Fargo' Guest Bruce Campbell on the "Terror" of Playing Ronald Reagan, Shared B-Movie Background". The Hollywood Reporter. Retrieved October 18, 2016. ↑ 209.0 209.1 "Dennis Quaid is playing Ronald Reagan in a biopic, confirms director Sean McNamara". Metro. March 28, 2018. Retrieved June 5, 2018. ↑ "Ronald Reagan is back on the campaign trail - as a hologram". AP News. October 10, 2018. Retrieved October 24, 2018. ↑ Raasch, Chuck (June 10, 2004). "Reagan transformed presidency into iconic place in American culture". USA Today. Retrieved July 2, 2008. ↑ "Toward the Summit; Previous Reagan-Gorbachev Summits". The New York Times. May 28, 1988. Retrieved March 8, 2008. ↑ "1987: Superpowers to reverse arms race". BBC News. December 8, 1987. Retrieved February 7, 2014. ↑ "Reagan Tops Presidential Poll". CBS. February 19, 2001. Retrieved September 7, 2007. ↑ "Presidents and History". Polling Report. Retrieved March 18, 2007. ↑ "Post-War Presidents: JFK, Ike, Reagan Most Popular". Rasmussen Reports. Archived from the original on October 11, 2007. Retrieved November 10, 2008. ↑ "USPC Survey". Americas.sas.ac.uk. Archived from the original on July 30, 2011. Retrieved August 12, 2011. ↑ Dionne, E.J. (October 31, 1988). "Political Memo; G.O.P. Makes Reagan Lure Of Young a Long-Term Asset". The New York Times. Retrieved July 2, 2008. ↑ 219.0 219.1 Kuhn, David Paul (November 8, 2010). "Jim Webb: Why Reagan Dems Still Matter". realclearpolitics.com. Retrieved October 13, 2014. ↑ Robert J. Samuelson (January 15, 2015). "Volcker, Reagan and history". Bradfordera.com. Retrieved January 18, 2015. ↑ "Ronald Reagan". California Museum.org. Retrieved January 25, 2015. ↑ "Ronald Reagan got a Marine recruiting letter while he was President". Fox News Channel. October 16, 2015. Retrieved October 16, 2015. ↑ Malkin, Lawrence (June 12, 2012). "Reagan and the End of the Cold War". The New York Times. New York. ISSN 0362-4331. Retrieved October 13, 2014. Wikimedia Commons has media related to Ronald Reagan.